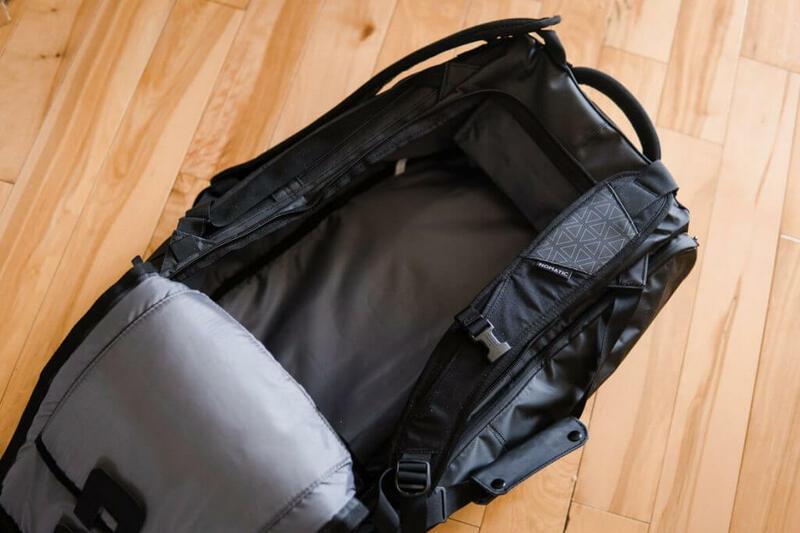 The Nomatic travel bag is one of the best bags I’ve ever carried around. Period. 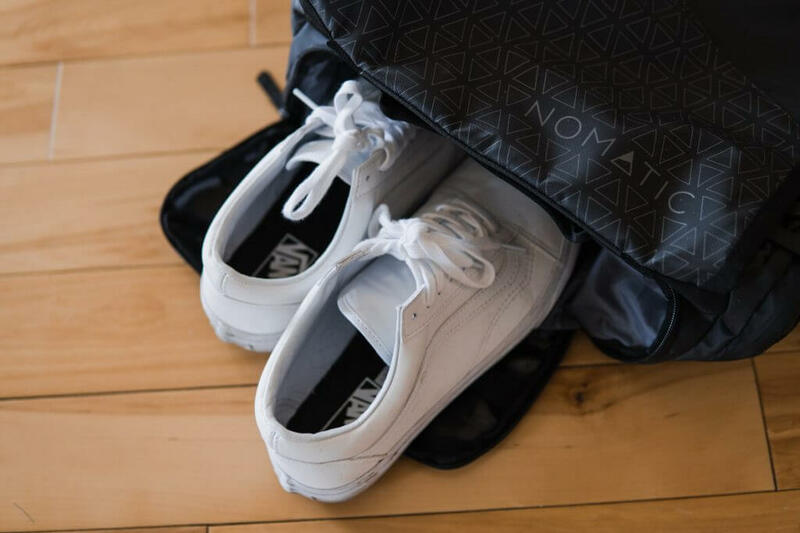 The design, functionality, and look of the Nomatic travel bag are all big reasons why I will be using and recommending the Nomatic bag to all of my friends. I received an Instagram DM from the folks at Nomatic about three months ago and they were kind enough to send me a bag of my choice from their online shop to test out. After a vigorous 2 months of travelling, I finally had the chance to test out the bag and I was not disappointed at all. 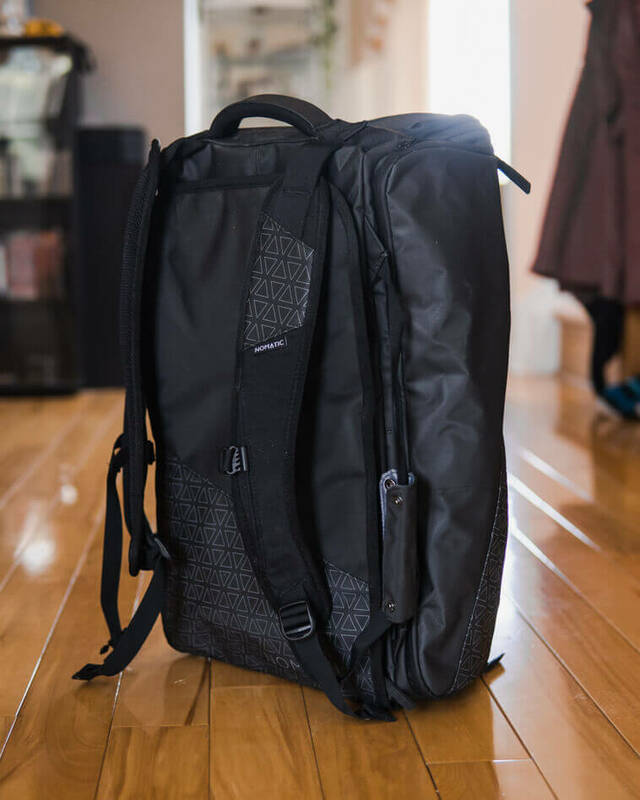 I’m no professional travel bag reviewer, but I’ll try to summarize my first impressions and thoughts on the Nomatic travel bag as best as I can..
A brief background on my previous carry. I’ve always carried a Herschel backpack as my tech bag and a separate Hugo Boss duffle bag for clothes. For longer travels, I would replace the Hugo duffle bag with a Samsonite rolling carry-on. The Nomatic Travel bag came in a big flat cardboard box and when I first took it out of the box, I could tell it was a well-made bag. I get sent a decent amount of equipment now, so I’ve seen high-quality and not so high-quality bags. This one would fit in the high-quality. Before examining the bag itself, I noticed some extra things included with the travel bag. At first glance, I thought these items were useless, but after using the bag for my travels, I’ve got a lot of good use out of them. Mainly, the toiletry bag, notebook, and the shirt folder. Now onto the Nomatic travel bag itself. The bag itself raised over $3 million dollars from crowdfunding and I can certainly see why. 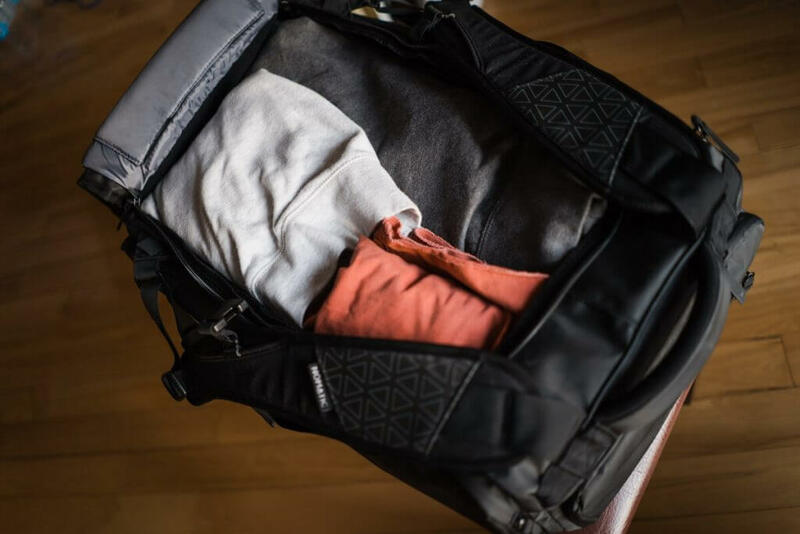 Here are some of the biggest features that made this travel bag the perfect one for my needs. 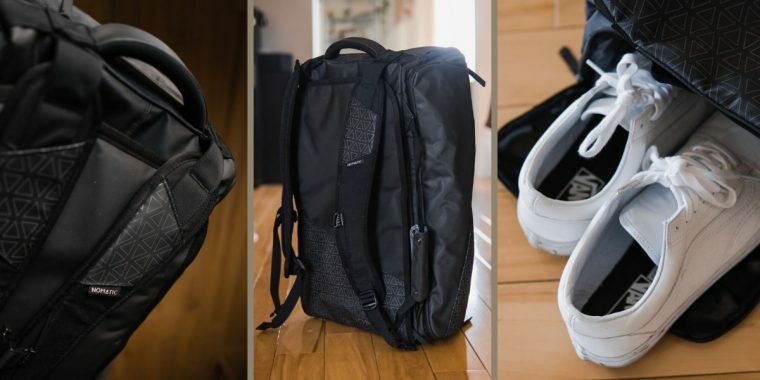 The most unique feature is that it can act as both a duffle bag or a backpack. If you’ve ever travelled by plane, this is such a huge feature because you can have this bag as a backpack and it carries as much as a duffle. This means you can store this bag under your seat. I hate checking bags, so this was by far my favorite benefit from the bag. Allowing me to carry even more for my travels, while not taking up a ton of space. I can’t stress enough, how well built the bag is. It’s made from waterproof material that is thick and durable. It is the type of material that you know is waterproof just from touching it – not the cheap stuff that is always claimed to be water resistant (trust me I’ve seen that before). On the topic of waterproof material, the toiletry bag they gave me was also made from the same material. My toiletry bags always end up wet on the outside so having an actual waterproof toiletry bag was such a great addition for me. 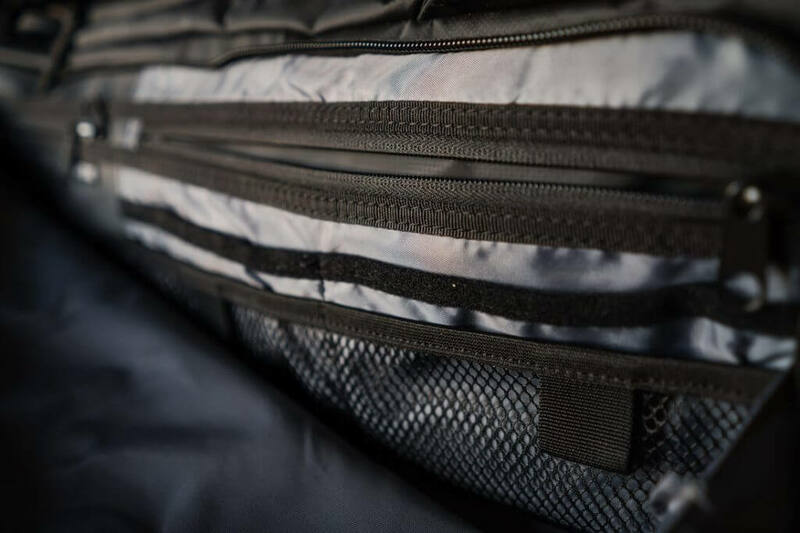 Especially if you’re storing liquids in the toiletry bag, you want a DOPP bag that is durable so liquids do not spill out and seep into your electronics or clothes. I have a love hate relationships for pockets on bags. You don’t want to have too many pockets because it usually sacrifices large space, but you also want enough to help you store smaller items. 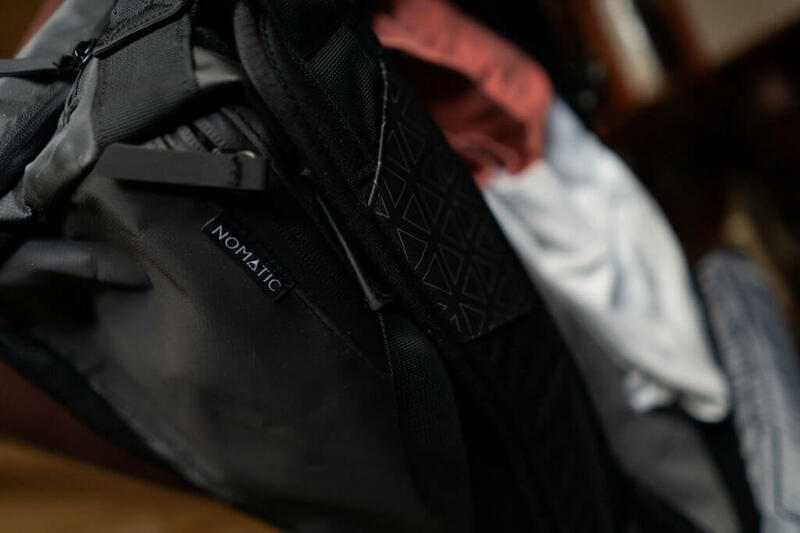 Although the Nomatic bag does have a lot of pockets, it makes a lot more sense because each one serves a purpose. An important purpose and you can tell by how well the design was thought out. Shoe Compartment – I usually carry more than one pair of shoes (gym shoes, dress shoes) on my travels, so having a pocket to store my shoes was nice to separate them from my clean clothes. Water Bottle Holder – Some people may use this bag for hikes or longer travels that require proper hydration. Heck, even just regular travels could you for proper hydration and a water bottle pocket is essential. 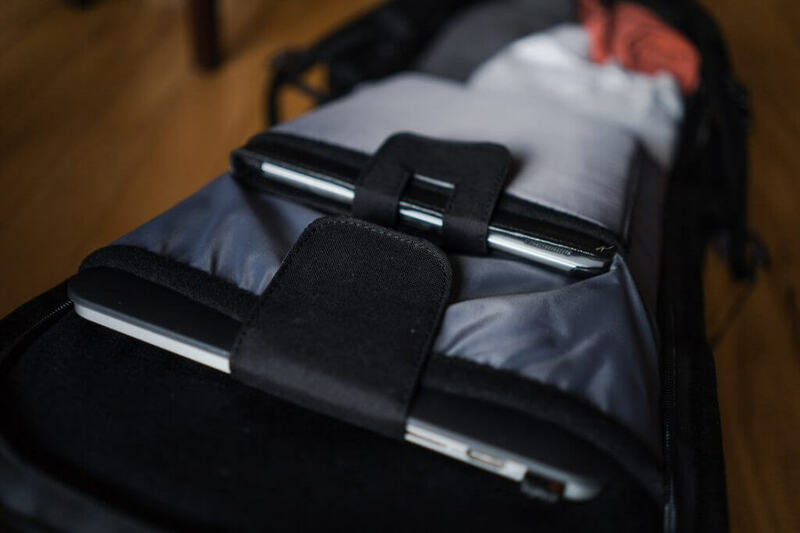 Laptop Slot – Personally, I don’t travel anywhere without my laptop so an easy accessible pocket that can protect and hold my laptop is essential. Airport security makes you take out your laptop, so you want to be able to have easy access to take out and store your portable computer. Pocket for Valuables – The last thing you want to lose is your passport or any important documents while travelling so having a pocket specific for your valuables is a great addition by the Nomatic team. A place to store cash or papers without having to worry about losing it. Book Pocket – I always carry a book on me when I travel and regardless if I read the book or not (I never do), having a place to store my book is very nice. As long as my book isn’t ravaged by the end of my trip, it leaves me the possibility of actually reading the book in the future (once again, this never happens). Security RFID Pocket – This pocket doesn’t really serve much use to me, but for someone else it might. A nice little addition for those who are trying to protect their information, clearly I’m not, but I probably should. Add-ons are something that I don’t typically consider when buying a travel bag, but it was different when I received Nomatic’s travel bag. These add-ons are by no means a way for Nomatic to sell items that should’ve been built into the bag in the first place. These add-ons are dependant upon the preferences of each user. If you bought the bag by itself, you would find all the benefits you would need from a typical travel bag and more. If Nomatic didn’t send me all of these add-ons I would’ve bought the toiletry bag, notebook, and shirt folder. I myself don’t personally need the laundry bag or vacuum bag, but I know a lot of people that would. Meanwhile, a toiletry bag, notebook, or shirt folder might not be useful to someone else. 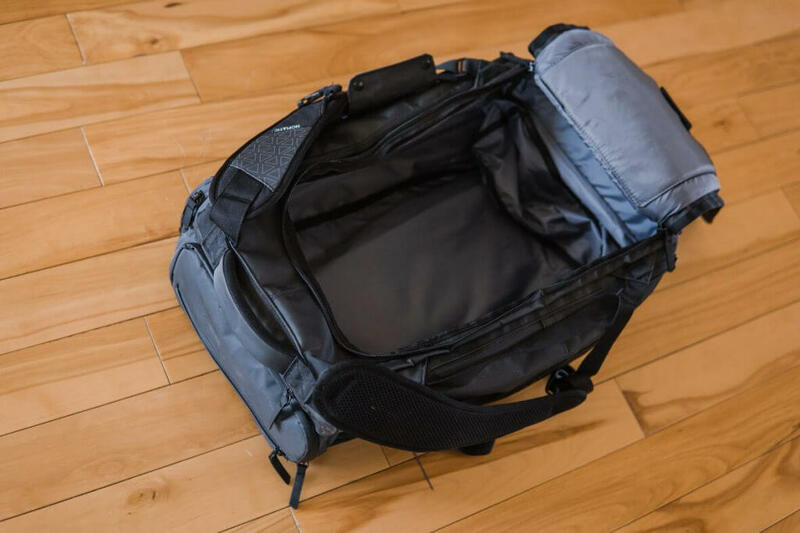 Now that I’ve covered most of the functional aspects of the travel bag, I want to talk about a factor that is very important to me when buying a backpack or bag. The appearance and style of the bag is incredibly important. I want a travel bag that can serve its purpose, but also looks good while doing so. Could the Nomatic bag do a bit better in terms of looks? Maybe, but overall the bag looks great – especially for what you’re getting out of the bag. 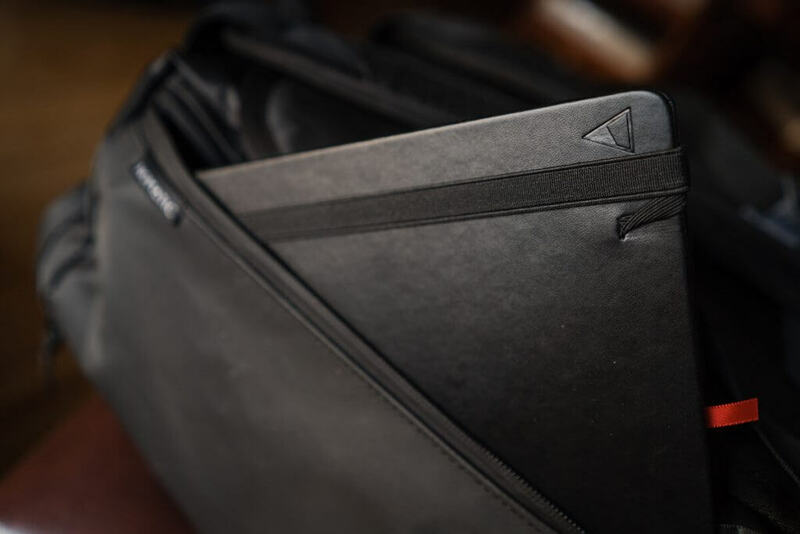 The all black appearance helps the bag from showing signs of wear and tear, but also helps compliment the sleek design that the travel bag offers. 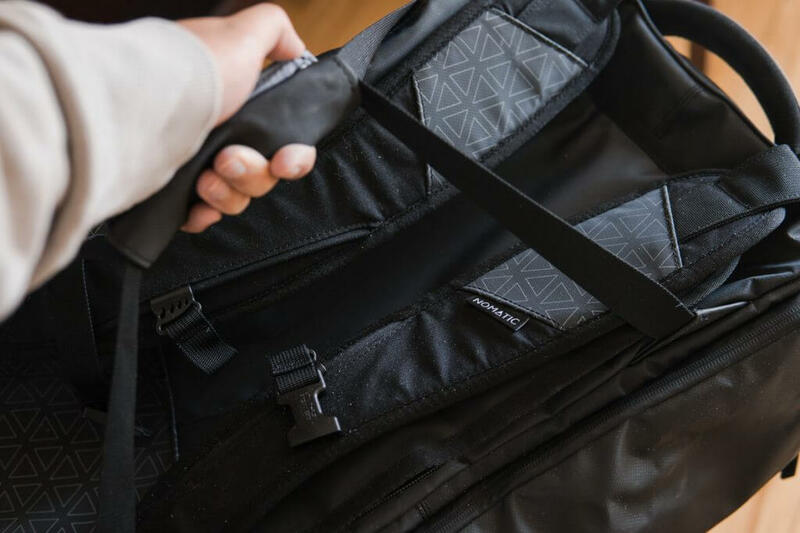 If the bag isn’t fully packed, you can wear it as a backpack without it looking too bulky, but if it is packed, you have the option to carry it like a duffle bag and it looks great. Overall, I am very happy with the travel bag. This isn’t a travel bag that I would be using on every occasion, but it is definitely a bag that I will be using for most travels where I want to bring just one bag for. 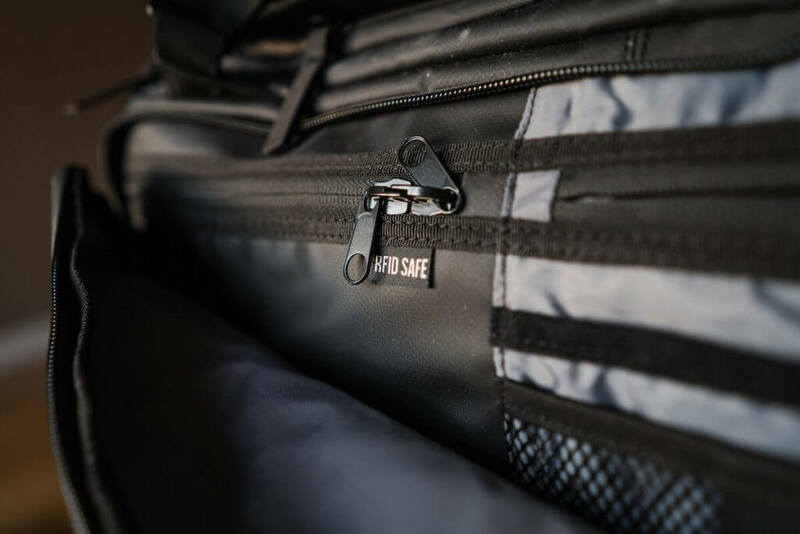 The durability and quality of the bag give me the confidence to store my valuables and electronics without worrying about damaging them on my travels. The sleek finish and well-thought design make sure I’m travelling in style while maintaining all functionality. I highly recommend this bag and if you are interested in checking it out, here is a link where you can buy the bag. Use code GRIDFITI20 for 20% off your purchase as well!